Compilation CDs, while having the advantage of being more diverse than albums featuring only one artist, often lack enough exclusive material to justify the purchase. A laudable exception is Bloe Baaschtert Presents: The Cell[O] Division whose previously unreleased material may also not be available in any other kind anytime at all. Therefore it’s quite a shame that it was only distributed at the Melting Session 4 that took place at the Philharmonie in December 2009. The event in question featured collaborations between artists from all kinds of genres with cellists. The compilation contains eight such duets, to more or less success, depending on your taste. The album starts with Daniel Balthasar and Emmanuelle Seiwerath, a nice opening piece that unfortunately doesn’t contain any of the local troubadour’s trademarks. Things improve with Pol Feltes, a singer/songwriter with strong roots in the Seventies, whose melancholic contribution manages to integrate the cello nicely into this music. Sermeq, together with the talents of Lisa Berg, lift the electro band’s dreamy electro sound to higher spheres thanks to the haunting cello performance. Cellist Judith Lecuit performs a song with a bass player and percussionist that come from a jazz background, certainly played with skill but unable to get my attention. The second half of the compilation comes with longer and far more interesting tracks. Techno artist Michel Van Tune and Lisa Berg come up with a marvellous eight minute miracle that effortlessly combines minimal dance beats with classical music. Sonic Attack team up with local icon André Mergenthaler to concoct a dark and brooding ten minute long monster that combines both artists’ love for scary sounds. Yikez!, formerly known as the vocalist of Torpid, offers an angular lo-fi gem with the help of Mylène on cello. The CD concludes with the contemporary music ensemble Lucilin whose abstract performance is furthermore enhanced by cello and bizarre electronics. 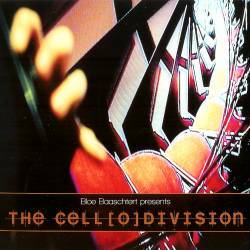 Bloe Baaschtert Presents: The Cell[O] Division is probably not an album you want to listen to from beginning to end, some contributions may make you want to skip ahead, but as a conceptual effort, it’s definitely highly original. Too bad it doesn’t seem to be available anymore.